The University of Hawaii Press had a crazy massive clearance sale a month or so ago. I bought a bunch of books for super cheap that I would normally never be able to justify paying full price for (upwards of $50 each). I also bought some other books for my collection; who knows if I’ll ever find the time to read them, but somehow it just feels good to have them. Somehow, I had never come across this catalog before in my research. I’m really glad I found it. The book divides Okinawa’s modern history into three periods: 1872-1945, when Okinawa was incorporated into the Japanese Empire; 1945-1975, when Okinawa was under US Military Occupation (which actually ended in ’72); and 1975-2008, when there was a resurgence in Okinawan culture and identity. The majority of the book is taken up by 1-4 page sections on each of a great many artists, both Okinawan and (mainland) Japanese, including both text and images. There are also a number of brief essays on each period of history, and on various themes within those periods. Being a Japanese publication, the vast majority of the book is in Japanese; however, the list of images, and Introduction essay are provided in English in the back. There are a lot of excellent pictures in here, both photos of Okinawa at various times in its history, and images, of course, of artworks; I look forward to reading about certain artists about whom I have heard of before, including mainland Japanese artists Yamamoto Hôsui and Tômatsu Shômei, but am also excited for the possibility of discovering native Okinawan artists about whom I might want to investigate further. *The Man Who Saved Kabuki is a book about Faubion Bowers, translated and adapted by Samuel Leiter from a book by Okamoto Shiro. Bowers (1917-1999) was apparently Japanese-language interpreter and “aide-de-camp,” as Wikipedia puts it, to Gen. MacArthur during the Occupation of Japan. Having spent time in Japan in 1940-41 and been exposed to kabuki previously, Bowers fought to rescue kabuki, and to see it continue, when Occupation authorities pushed for it to be banned for its display of feudal values. The history of kabuki in the modern period is something I know extremely little about, but as a fan of kabuki, I suppose I owe a great debt to Bowers; I look forward to someday finding the time to read this book, and learn a bit more about kabuki history beyond the “core” periods of its high points, i.e. in the Edo period. *Which brings us to the four volume set Kabuki Plays on Stage, which I absolutely cannot believe I was able to get for so cheap. Each of these hardcover volumes normally goes for around $50 cover price, so to get them for literally 95% off was an absolute windfall victory. Books I never thought I’d own now sit prettily on my shelf. The four volumes, edited by James Brandon and Samuel Leiter, consist primarily of translations of kabuki plays by Brandon, Leiter, and others, 51 plays in total. In this alone, they are an unbelievable resource, since the majority of other translations out there are scattered between books with titles like “Five Classic Plays” and “[Overview of] Traditional Japanese Theatre.” These are, of course, excellent books as well, but when one is looking for the translation of a particular play, or is just skimming through to find a variety of different plays, a selection of 51 cannot be beat. Of course, some of the longer jidaimono plays, long enough to take up over 250 pages in their own separate publication, are not included. Each play translation includes pictures of performances, ukiyo-e prints, and the like, providing a visual element to help bring the play to life in the mind of the reader; introductions before each play explain literary references, historical origins of the play, and other interesting and important aspects. Lengthy introductions in each volume provide detailed overviews of the history of kabuki, and I expect will serve as an extremely useful basis for if/when I ever write out a summary of kabuki history for the Samurai-Archives Wiki – these could also serve as excellent readings to assign to students, I expect. I cannot wait to delve into these books. *Southern Exposure, edited by Michael Molasky and Steve Rabson, is a collection of Modern Japanese Literature from Okinawa. It includes a number of poems, and 12 short stories, in translation into English, ranging from 1922 to 1998. Having not yet read any of them, I cannot say for sure, but I would think it a safe bet that none of these pieces (with the exception of a single verse from a set of translations of Old Poems) describe or refer back to the time of the Ryukyu Kingdom, and that all of them address more modern issues. There is certainly a certain appeal to be found in the complexities of Okinawa’s modern history, political issues, and identity politics. From the overthrow of the kingdom, assimilation policies, and suffering under the control of the Japanese in the 1870s to 1940s, to the devastation of the Battle of Okinawa, 27 years of American Occupation, the continued American military presence today, and issues of identity, diaspora, and cultural decline or revival, there are certainly a lot of touching, powerful, complex, issues to be addressed. I, personally, am still sort of coming around to any interest in these sorts of things. I think being in Hawaii was good for me, surrounding and immersing me in those kinds of politics; now that I’ve been removed from it once again, perhaps I’ll go back to feeling distanced from it. Or perhaps I will continue to sort of grow into being interested in such issues. For one reason or another, literature has never really interested me, even as my interests in art, music, theatre, and various other fields have grown. But, as an Okinawan Studies scholar, it certainly never hurts to have more Okinawa-related books on my shelf. There are so few in English that to avoid buying something like this feels like it would have to be a very conscious, intentional, and obvious choice; an obvious gap in my collection to anyone who skimmed my shelves and knew what they were looking at/for. *Prisoners from Nambu is a book I have seen countless times before, on shelves, and have always passed up. It explores a very particular incident in Japanese history, involving the capture of a number of Dutch seamen by people of Nambu (in the far north of Honshû). Being that it is such a specific incident, and not one that I am myself researching, I never gave this book much thought. 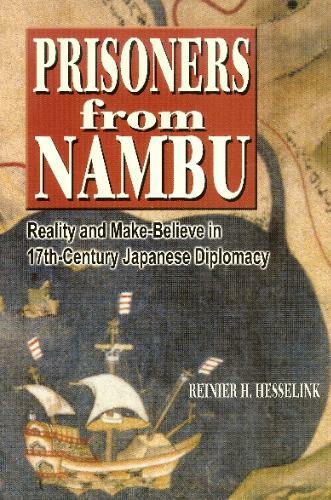 But, then, after glimpsing over the ideas behind Luke Roberts’ new book “Performing the Great Peace,” and struggling with the issues of secrecy and deception in the Satsuma-Ryûkyû-shogunate relationship, I realized that, given the subtitle of this book, “Prisoners from Nambu: Reality and Make-Believe in 17th century Japanese Diplomacy,” it could be of some interest and some use. We’ll see if I ever get around to actually reading it at all. 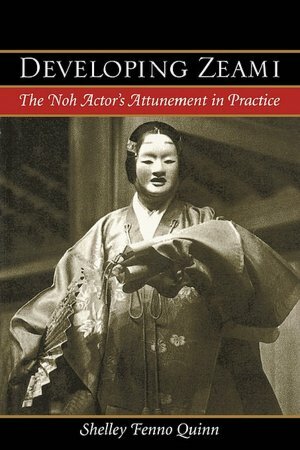 *Shelley Fenno Quinn’s Developing Zeami seems to be a somewhat more practical guide to the use of Zeami’s writings as guidance for one’s performance of Noh – as compared to some of her other work I have read which seems to focus more on Zeami’s writings as writings, as literature, as historical documents useful for us scholars in understanding and interpreting Noh. *Critical Perspectives on Classicism in Japanese Painting is an edited volume which came to my attention because of my use of essays by Elizabeth Lillehoj in attempting to understand how paintings might have served as visual records of official ritual events. 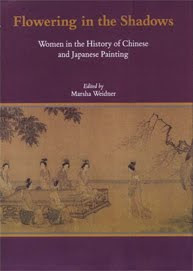 Her essay in this volume focuses on a series of fusuma-e (paintings on sliding doors) in the palace of Tôfukumon’in, depicting the Gion Matsuri. Much of Lillehoj’s work focuses on Tôfukumon’in, on issues of patronage, and on fusuma-e and the like in the empress’ palaces. Other essays in the book discuss different aspects of the phenomenon of the use of classic themes – e.g. references to the Tale of Genji, or Heian period poetry – in early Tokugawa era painting. There are, as to be expected, several essays on Sôtatsu and Kôrin – interesting artists who produced beautiful works. 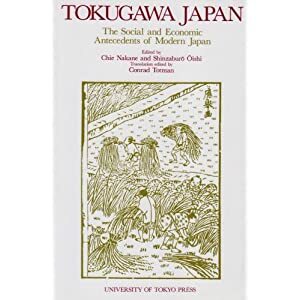 *Tokugawa Japan: The Social and Economic Antecedents of Modern Japan is another book that’s not from UH Press, but which I recently obtained. The idea of approaching Tokugawa Japan as an antecedent, and not as a subject worthy of attention in its own right, is troublesome, I think; but, at the same time, the idea of Tokugawa Japan as a vibrant, active, complex society with its own “traditional” equivalents to banks, mass media, postal service, highways & tourism, etc. is a valuable one, highlighting what makes Tokugawa Japan so exciting. *Finally, we have Challenging Past and Present, a volume edited by Ellen Conant, which, like Lillehoj’s “Classicism” volume, focuses on a specific period and set of themes within Japanese art history, in this case, the “metamorphosis of 19th century Japanese art” as Western influences poured in, and as societal pressures pushed artists to explore ways of being more “modern” in their art-making. Though I should like to see more essays more explicitly addressing the origins and development of Nihonga, the volume focuses more on topics such as Yokohama-e prints, Meiji tourism & photography, the Rokumeikan, and “Imperial” architecture. Fortunately, all of these are plenty interesting topics as well. Prior to going to Hawaii, I had little interest in the Meiji period, thinking of the Tokugawa period as the real “height” of “traditional” Japan – by Meiji, everything from kabuki to ukiyo-e, to the worlds of the geisha, the samurai, etc. were in decline. And why should I want to study something in decline? But. Having now studied the issues of modernity more extensively, with a professor who specializes in this period, and these topics, I have come to see Meiji not as a period of decline, but one of interesting and exciting cultural clashes and cultural meldings. People negotiated with their past, with their identity, struggling to advance face-forward into modernity, without losing their distinctive Japanese identity. Besides, the further we get from that period ourselves, the more this world of 100+ years ago resembles its own “tradition,” its own distinctive romantic(ized) aesthetic. So, whether it’s the Rokumeikan, or Japan at the World’s Fairs, it’s not a Japan that’s in decline, but rather simply another Japan, a different Japan, with its own separate appeal. A few of the early essays in the book address the historical background and historical development of Japanese art at this time in a broader sense, and could hopefully be interesting and useful for understanding these shifts in a broad, overall sort of way. One of the later articles I am particularly interested to read is by Martin Collcutt, and discusses “the image of Kannon as compassionate mother,” the subject of a pair of oft-cited and very interesting paintings by Kanô Hôgai (as well as one later copy by Okakura Shusui). I’ve been fortunate to see the Smithsonian’s copy of the painting in person, as well as the Okakura copy at the MFA, and the one in Tokyo virtually/digitally, and would be interested to see what Collcutt has to say about the differences between the copies, and the prominence of this particular composition; other scholars, including Chelsea Foxwell, have written about the same set of paintings, so it would be interesting to see how their approaches or conclusions compare.